As I strode into SAM on a sleepy Thursday morning I realized that the only time I had ever seen Miró’s art was in college studying Gardner’s Art Through the Ages. As you can imagine, seeing the works of a master is hardly impressive when you see them as a two by three inch picture in a textbook. I had no idea how magnificent they could be in person. 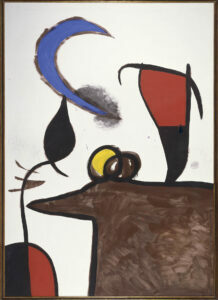 Miró: The Experience of Seeing has made landfall at the Seattle Art Museum, giving visitors a unique opportunity to see the works of a Catalan Spanish master for the first time. Due to their strong international reputation as an ambassador for culture and the arts and their willingness to embrace the large scale effort needed to bring in some of the most high profile exhibits, Seattle Art Museum has made the Emerald City a go-to arts and culture destination. Because of SAM, Seattleites have had the privilege to see such exhibits as Picasso, Gaugin, Peru, and now Miró: The Experience of Seeing. The Experience of Seeing features over 50 paintings, drawings and sculptures from Joan Miró’s later body of work, spanning two decades of his life from 1963 to his death in 1983. All of the works come directly from Spain’s National Museum of Modern and Contemporary Art – Museo Nacional Centro de Arte Reina Sofía – in Madrid, making their first and only stop on the west coast. 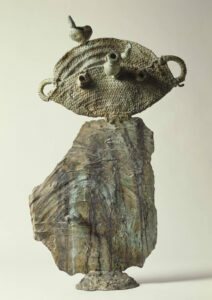 This exhibit gives viewers a rare opportunity to see a collection of his found object sculpture and surrealist paintings which share a direct dialogue due to their subject matter. He has reimagined the night sky with imagery including stars, birds, and women – personified in sculpture and on canvas. Miró’s work influenced modern visionaries such as Pollack and Rothko who took abstract expressionism to the forefront of American culture. You can see how Miró’s deconstruction of realism informed the style of his contemporaries; these parallels between their works become evident as you go deeper into the exhibit. Miró also pushed beyond the concepts of his contemporary Pablo Picasso as he continued to simplify and deconstruct the human form. Many of his paintings address themes of whimsy which stem from his early childhood in Catalonia. These expressive and colorful paintings are especially accessible to young audiences due to his use of primary colors and bold shapes in space. 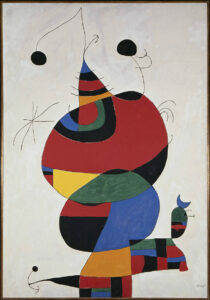 Miró pointedly said “…everything which is bare has always greatly impressed me” which is evident in Woman, Bird, Night. I recently had the opportunity to see this exhibit and was blown away by the grand scale of his works. His largest canvases stretched nearly 12 feet high and 6 feet wide allowing you to appreciate the work that he put into the deliberate ease of his paintings. The highlight of the exhibit for me was getting to see a large collection of his found object sculpture, which have an entirely different energy in person than you would expect. His creation process was unorthodox, painting his sand-casted bronze, making the finished product incredibly unique. They all have a playful animated feel to them which can’t help but make you smile. The end of the exhibit brings you full circle, ending in an interactive room complete with a timeline of Miro’s life. This exhibit will only be on view in Seattle until May 26 so don’t miss your only chance to Miró: The Experience of Seeing on the west coast! 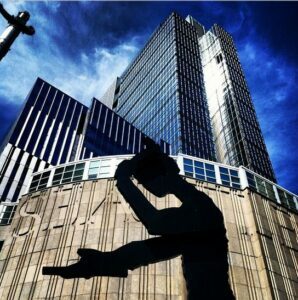 Seattle Art Museum is open Wednesdays-Sundays with extended hours on Thursdays. Admission prices vary; see website for details.